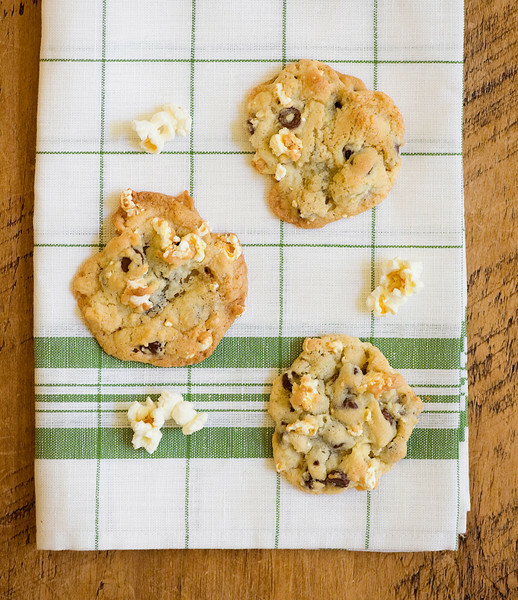 Adding a little popcorn to chocolate chip cookies is a whole new wonderful twist on sweet and salty! Try it with this easy recipe for popcorn cookies…it may change the way you look at chocolate chip cookies forever, what with all the delectable sweet and salty going on. A few weeks ago I discovered the wonder that is chocolate dipped potato chip cookies, and after falling head over heels for those I immediately started rifling through my snack cupboard to see what other snack foods I could bake into cookies. And while snack foods come and snack foods go in my house, one thing I always, always, always have on hand is popcorn. And so I thought….popcorn cookies! Two great tastes that taste great together – let’s make them! Because I am all about the sweet and salty anything and everything. I’m also happy to mix up popcorn with just about anything…I drop it into soup, I mix it up with caramel and bacon (of course), and I am perfectly happy just popping up a big mess of it and eating it with a little drizzle of butter and salt. So once the lightbulb went off, it made perfect sense the popcorn and chocolate cookies could be best friends. So here’s how this goes: you start with a basic light chocolate chip cookie dough…but when it comes to the part where you stir in the chips, you are also going to stir in some popcorn. I like to pop my own (and if you have never done this, it’s as easy as putting about a 1/4 cup of popcorn in a plain old brown paper lunch bag, rolling the top down and microwaving it for about 2 minutes). And if you turn into a homemade popcorn groupie like me, I highly recommend this particular popcorn popper. The. Best. Once your popcorn is popped, salt it a little and crush it just a little in your hands. Once the cookies are done, they are a perfect mix of sweet chocolate, salty-crunchy popcorn and cookie. Light and sweet and scrumptious. Clearly I need to figure out a cookie version of pretzels. They are up there in my snack cabinet as we speak feeling all left out. Preheat oven to 350. Cream butter and sugar until fluffy and pale, about 2 minutes. Add egg and vanilla and beat until well-combined. In a smaller bowl, mix together flour, baking soda and salt. Add slowly to the butter mixture, making sure the flour gets fully combined (scrape the bottom of the bowl to be sure). Stir the chocolate chips and the popcorn in carefully. Using a cookie scoop, drop tablespoons of dough onto a parchment-lined cookie sheet, spacing the cookies about 2 inches apart. Bake for about 12-14 minutes or until lightly golden. Cool for 5 minutes on the cookie sheet and then remove to rack to cool completely. Hi, do you pick through the popcorn that you will use in the dough and be sure there is no un-popped corn surprise to break a tooth on ? I think I have to try the potato chips and chocolate this week. I think it is a brilliant way to get both my sweet and my salty at one bite, thank you for that , lol . You are the sweet and salty cookie queen! I’m thinking for pretzels…salted caramel needs to be involved. Just saying. Genius. You are so right. This is an awesome idea. I love the look of these cookies too. The popcorn doesn’t brown/burn at all? I bought a delicious candy bar from a lady on Etsy who makes all her own candies. It was very like a Snickers (only better), and along with the peanuts in the caramel, there were crushed pretzels — so peanut-y caramel and crushed pretzels, all enrobed in a thick chocolate coating. OMG!